About 247 graduates applied for enlistment into the Ghana Police Service in the Upper East Region for the 2018 recruitment season. Out of the 247 applicants, 215 turned out for the screening exercise which saw 89 individuals qualifying for consideration into the next stage. The rest of the applicants were disqualified due to over age. Six holders of Higher National Diploma (HND) Certificates wrote examination to be considered as caterers in the service, while about 665 other general duty applicants were examined before qualifying to the health screening and medical examination stages. The Upper East Regional Commander, Deputy Commander of Police (DCOP) Mr Redeemer Vincent Dedjo who spoke to the Ghana News Agency in Bolgatanga said some of the applicants were disqualified for presenting forged birth certificates. According to him, about 138 tradesmen including; drivers, electricians, tailors, carpenters, and masons, sat for the examination to be considered into the force. The required age for consideration into the service according to Mr Dedjo is the minimum age of 18 to 27 years for general duties, 30 years for graduates and 35 years for professional graduates. 'We relied on the BECE Certificate because that certificate has the individual date of birth, and that was considered authentic' DCOP Djeto stated. Some of the applicants were also disqualified because they did not meet the required height of 5.6 metres for males and 5.3 for females. The commander added that people with flat feet, scars, Genu valgums; commonly called 'knock-knees' were not considered into the next stage. The requirements into the police force, he added frowned against 'uncultured' fashion such as tattoo, rasta hair, men with perforated ear for ear rings, and multiple earrings, mostly seen on females. 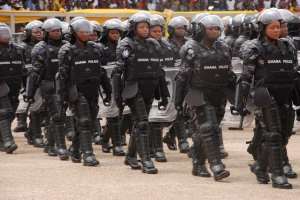 Speaking on medical qualification, the commander stated that the Ghana Police Services operated to meet international standards and 'persons infected with HIV virus will not be enlisted'. DCOP Dedjo warned that persons who forged documents to be considered for enlistment into the service were liable for prosecution after an appropriate authority on the matter had advised.